Now normally, you might guess that those five male cats were figuring their chances for a snack. But, I KNOW my cats. They weren’t hungry, they were just curious and excited to see their “Mama” with a little bird on her shoulder. These weren’t tree birds for stalking, these were new friends! Even so, we didn’t take chances. Our litle gals were still quite small and free-ranging was out of the question for the moment (did I mention our two big dogs????). So, five cats promptly climbed on top of the protected run and stood guard. Hour to hour, they swapped positions for weeks on end. I don’t believe those chicks were ever unattended! Of course, we were still wary and took no risks. Then one fine day about 6 weeks later, as I was cleaning, Spike slipped in the coop with me. Frankly, Spike is a ruthless predator. He’s beautiful and sweet but he has this wild side that comes with living on five country acres. However, he promptly went up to one of the girls, sniffed her, sighed a happy cat sigh, and laid down in front of her. 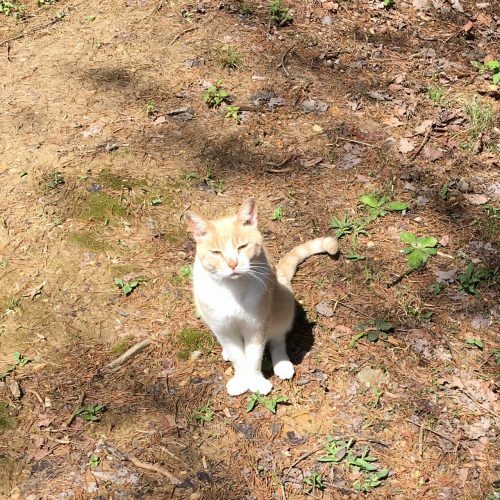 No nibbles, no growling, hissing, pecking, squawking, or chattering…..Spike positioned himself at Gertie’s feet and declared himself protector and friend. The others—Charlie, Jack, Spot, and Sylvester—have followed suit and funny thing, they all exhaled the same happy cat sigh! Spike and Gertie, friends from the beginning! We now have five chickens with supervised free-range time. 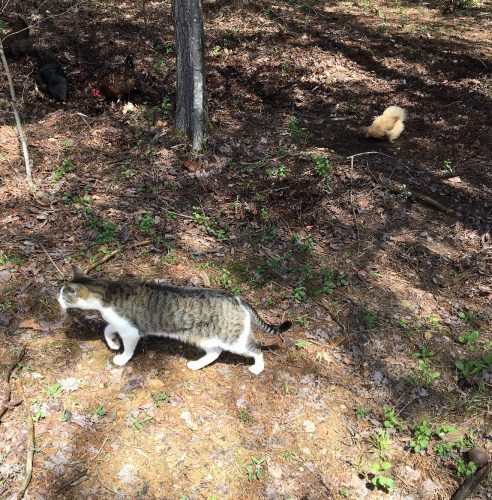 Luckily, it’s not me alone that supervises; while the girls are running about doing their “chickenly” business, there are usually at least two cats flanking their position, hanging out, watching, and protecting! So with new chicks coming in a few weeks, we will have a new introduction time. Of course, you must be wary, smart, and KNOW your cats well. Sylvester on a pass around the foraging girls! Don’t hide the birds. Make sure the cats and chickens can see each other from day one. Be especially cautious when the chicks are little and only allow for viewing each other….no physical contact! 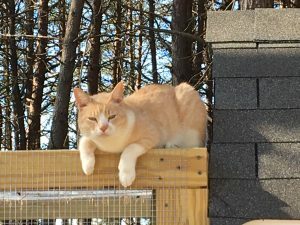 When the chicks are ready to move to the “big” coop, make sure there is a way for your cats to spend time safely watching them, without “Mama and Daddy” around. This allows the cats to grow accustomed on their own and not be surprised by squawking, dustbathing, and general chicken behaviors. We accomplish this by allowing the cats to sit on top of the run at their own leisure. Make sure you use hardware cloth or something your cat can’t stick her paw through to pull out baby birds—or parts of them—when you’re not looking! Make sure you show affection to the birds in front of the cats and vice versa. Then they see that each other is “okay” and loved. When the birds are at least as tall as the cats, allow for a supervised contact with your most trusted cat. When you start free-range time, always supervise until you see the comfort develop on the hen’s side. My hens are not the least bit concerned by the cats and I’d like to think they appreciate the guard duty. Finally, if you EVER see aggressive behavior from one of your cats towards a chicken, intervene immediately. It’s best not to push it. Just keep that particular kitty in when your girls are roaming. Good luck! It’s really relaxing and beautiful to sit outside and watch the cats and chickens interact with each other. Now if we could just get the dogs on board! My two kitties love our chickens! They like to relax in the coop in the hay with the girls. I’ve never seen them be aggressive toward our chickens or their chicks. It’s precious to watch. Like you, our dogs are a different story. What an enjoyable and informative article! Thanks to the author for sharing her personal experience! Very well written article! The author is a natural storyteller. Can’t wait to hear updates on the new chicks! This was a charming glimpse into a chicken owner’s life. With your dogs,cats, and chickens it seems like you have a full house. (I guess I should say full yard, technically. ha.) I for one, am looking forward to your future blogs. I think we have to many chickens for our 2 kitty ladies to think of attempting to intimidate. Not to mention that every 15 laydies have a fella watching out for them. I love your tips for integrating! I’ll have to come back to this when we need to get new kitties. We have 29 chickens, all different sizes and breeds. Our dog is a Rat Terrier who will catch a mouse faster than any of our cats. He is a born hunter, and has even taken on small packs of coyote . We were very worried about letting him near our chickens, for fear he would tear them apart. Amazingly, using basically the same steps you posted above, our dog is the protector of the flock. I pity any predators that try to get past him! Excellent article! Your cats are remarkable! I never would have guessed that cats and chickens would or could be friends. Great article, very informative. Thanks for the tips! Great article,love all the photos. 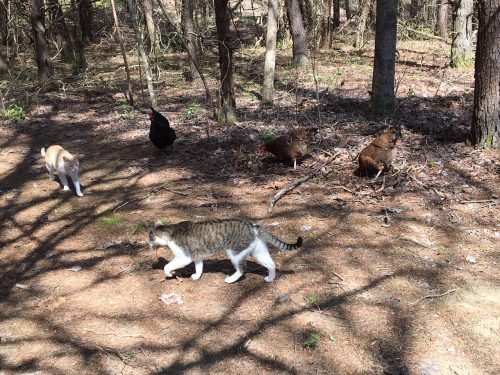 Who knew that chickens & cats can live in harmony, lol . I was raised in central WV in the 1950s and this article reminds me of our farm life. Everything was “free range”, and all our farm animals were buddies! We always ordered chicks each spring, and used the adult male for Sunday dinners and the hens for the egg production. This is such a sweet and sincere article, and very informative. I can actually see this as a children’s book! It’s a thought to keep in mind! 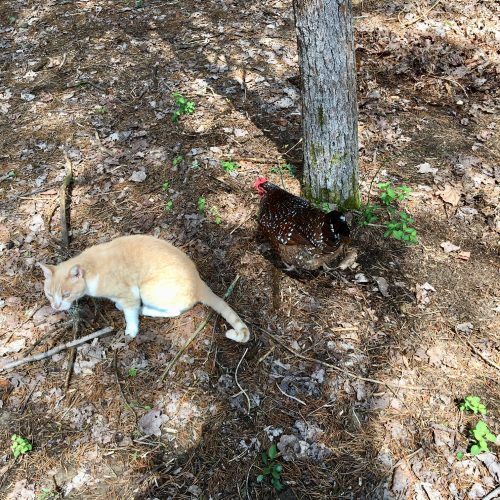 This is a great article that proves cats and chickens can definitely get along! The tips given outline how to help them assimilate and start the relationship off right! I like the details you provide and advice into slowly easing the transition. The pictures are very cute too 🙂 You obviously have a heart for them and the knowledge to take great care of them all, and that transfers into a loving home where all the animals feel comfortable, happy, and loved. Great job!! My cat is super protective of my 8 chickens. He helps me herd them back into the coop. He watches for hawks. He stands guard. By far the funniest thing he’s done is to bring them dinner. He caught a vole and carried it over to where they were lazing under a tree and dropped the vole in the middle of the pack. They all hopped up and ate vole. He wandered off looking pleased with himself. That’s awesome! Isn’t it fun (minus the vole demise) to watch them get along?